The first trailer and poster for Seth Rogen and Evan Goldberg's directorial follow-up to This Is The End has made its way online and it is a bold premise to say the least. James Franco re-teams with Rogen as a talk show host and his producer who land an interview with Kim Jong-un and in an attempt to legitimize themselves as journalists they travel to North Korea where the CIA (in the form of Lizzy Caplan it seems) intercepts and recruits them with the intent of assassinating the supreme leader of the Democratic People's Republic of Korea. Clearly this will go all kinds of wrong along the way, but the trailer makes this look like a truly broad and much bigger film than Rogen and Goldberg's first effort that they have handled well. I am always anxious to see what this group of funny guys venture into next and with Rogen and Goldberg behind both the script and camera I can't help but think this might be some kind of kindred spirit to Pineapple Express. What is almost more interesting about this project is how the studio will plan to market it from here on out and how the media will react and cover the film when it gets closer to the release date. The question of if Jong-un were to ever actually see this and naturally get offended are Rogen and Franco painting a big target on themselves and their countries head? The fact they don't seem to care makes this feel all the more fresh and downright ballsy. Regardless of these outside factors I am eager to see the artistic strides Rogen and Goldberg have made and if The Interview will be another hit for their new prime or a misstep just as things were getting good. The Interview also stars Randall Park and opens on October 10. 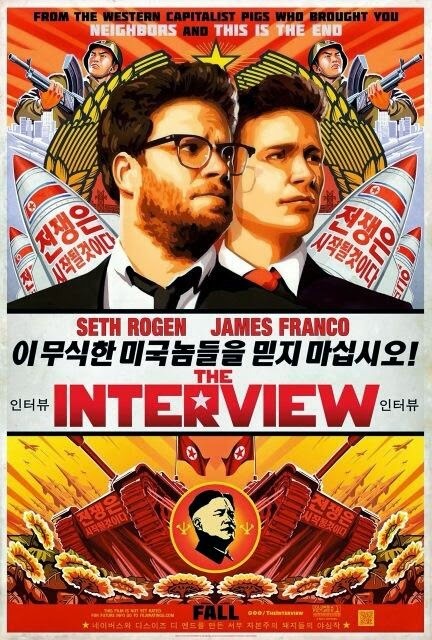 Synopsis: In the action-comedy The Interview, Dave Skylark (James Franco) and his producer Aaron Rapoport (Seth Rogen) run the popular celebrity tabloid TV show “Skylark Tonight.” When they discover that North Korean dictator Kim Jong-un is a fan of the show, they land an interview with him in an attempt to legitimize themselves as journalists. As Dave and Aaron prepare to travel to Pyongyang, their plans change when the CIA recruits them, perhaps the two least-qualified men imaginable, to assassinate Kim Jong-un.